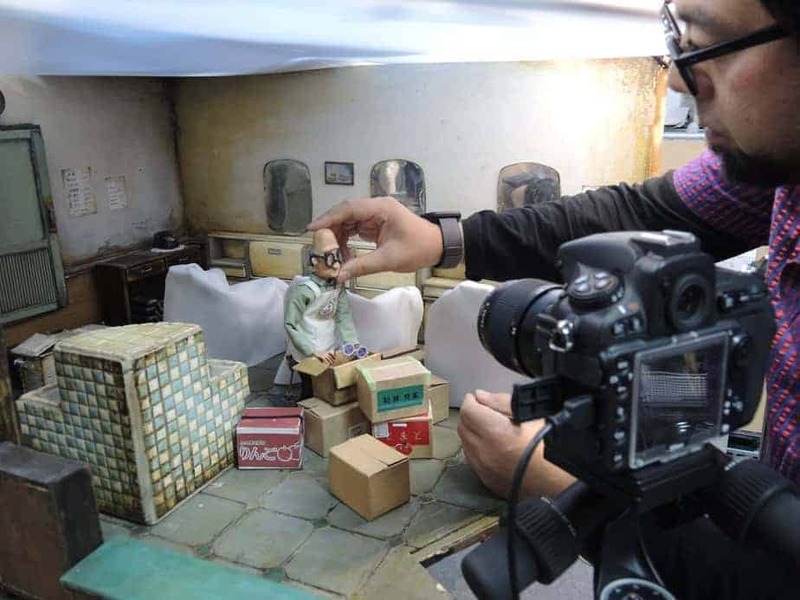 One of Japan’s most prolific independent animation artists, Tomoyasu Murata (1974, Tokyo) has steadily created breathtaking, boundary-breaking stop motion animated films over the last two decades. Inspired by the expressive power of traditional Japanese bunraku puppet theater, Murata’s films—at once tender, whimsical and mysterious—deal with themes of memory, absence and mujo (the Buddhist concept of impermanence) through the cinematic manipulation of his meticulously handcrafted puppets and fantastical miniature sets. Japan Society is proud to introduce Murata’s work to New York City for the first time through the career-spanning program Tomoyasu Murata: Stop Motion Master, featuring the North American premiere of eight short films that range from the artist’s award-winning student work to recent projects that respond to the 3/11 Great East Japan Earthquake. Beginning his career as a student at the Tokyo National University of Fine Arts & Music, Murata won the Japan Media Arts Festival Excellence Award (Animation Division) in 2001 for his short film Nostalgia. Since then, he has produced a wide range of work—encompassing animation, video, sculpture, collage and mixed media—that is regularly exhibited in solo and group exhibitions and film festivals in Japan and abroad in Asia and Europe. In 2002 he started his own independent company through which he also produces creative commercial work including music videos and advertisements. Saturday, February 23, at 3 pm, 5 pm and 7 pm. Admission: $14/$11 seniors & students/$10 Japan Society members. Tickets may be purchased online at japansociety.org, in person at Japan Society, or by calling the box office at 212-715-1258. Organized in association with Japan Media Arts Festival presented by the Agency for Cultural Affairs, Government of Japan. Approx. 84 min. total. DCP, color, no dialogue. Directed and animated by Tomoyasu Murata. In Murata’s award-winning thesis work, which mourns the loss of a loved one, an elderly man’s daily routine is interrupted by a rediscovered fragment of a precious memory. 2000, 16 min. Part of Murata’s “Road” series, a sorrowful pianist on a journey meets a girl who gives him a vermillion flower in a tunnel connecting them to a world beyond. 2002, 14 min. The Seven Lucky Gods (or kami, meaning both “hair” and “gods”) live in the Takada’s barber shop in Tokyo—a set based on a real-life now-lost local store close to Murata’s heart—where they play charming tricks on the family of four. Three selections from a 6-film series. 2007, 15 min. In the first episode in a series of films centered on The Great East Japan Earthquake, an amnesiac wolf traces his past and escapes from hunters who are after him in an eerily beautiful moonscape. 2015, 11 min. The island repeats volcanic eruption after earthquake, smoke and glowing heat bubbling from the morphing surface—but when the tectonic activity recedes, all is sand and, finally, the miracle of water flowing, of life. 2016. 11 min. Twins are separated by the destructive earthquake and tsunami that ravaged Japan’s Tohoku region in 2011, but with a swirling snow globe, they traverse the present and the past, the living and the dead: reconciling, remembering, and restoring. 2017. 17 min. 1983, 131 min., DCP, color, in Japanese with English subtitles. Directed by Shohei Imamura. With Ken Ogata, Sumiko Sakamoto, Tonpei Hidari, Takejo Aki. Shohei Imamura’s 1983 Palme d’Or-winning masterpiece is set in a remote mountain village in 19th-century Japan wherein tradition dictates that those who reach the age of 70 must be carried to the top of Mount Narayama and left to die. Despite her hardscrabble surroundings, Orin (Sumiko Sakamoto) is still sprightly at 69, working the fields and managing her family’s affairs. Even so, when winter returns to the valley, she demands that her eldest son (Ken Ogata) carry out her fate. A film full of mud, lust, sweat and death, Narayama is a grand culmination of Imamura’s career-long interest in “the lower part of the human body and lower part of the social structure,” presented in a brand-new 4K restoration. Tickets: $14/$11 seniors and students/$5 Japan Society members.